Barbless hooks increase your catch rate while on the water. This topic comes up throughout the season. Here are some thoughts to consider in regards to this claim. Why is it most shops around the country still supply predominately barbed hooks? Maybe because tradition has a way of reluctance to change would be my first guess. Our delayed harvest is back in full swing in western NC with very high numbers of trout landed daily. It makes our life much easier as a guide/instructor to simply give a bit of slack and have the hook just fall out! This leads to higher numbers of fish landed throughout the day with reduced fish mortality from over handling. Barbless hooks increase your catch simply because the hook sets penetrate quicker. While tying flies with my boys (10 and 7 years old) the other night this question came up. It was worded a bit differently from my oldest son but went something like “why do we waste time grabbing pliers for mashing barbs when they are less sharp, to begin with”? The magic lies in the simplicity of hook penetration with barbless hooks. This is an easy concept to explain and demonstrate even to young kids. 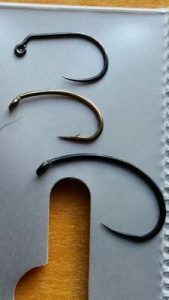 Here is a quick method for comparing the barbed versus barbless hook debate on which benefits you more for time on the water. Test this for yourself with a cardboard box or piece of heavy paper and compare the difference. Is a wedge (barbed hook) or a spear (barbless hook) easier to penetrate the cardboard? The barbless hook can lead to a higher percentage of fish hooked because it penetrates with less effort. 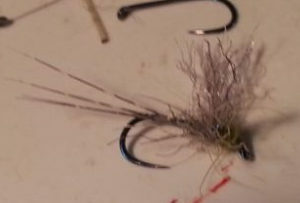 The masses of fly fisherman believe that the barbed hook will keep fish on easier to be landed. A better technique is the reason folks land fish. If the rod applies pressure (equates to tension) then the rod is bent like the capital letter C then all is good for landing fish. This is good technique as long as the C is maintained while playing fish. The next factor which is a win for barbless is that it is quick to remove from fish so that you may catch another one quick! In the event that you ever hook yourself on accident, it also is quick to remove from you. Wow, less injury to you and fish yet barbless is still a minority wire around the country. The barbless hooks fall out of the fish without even having to handle the fish once they are netted. This makes the catch and releases a simple task due to a lessened mortality rate for releasing fish quicker (less handling overall). It also keeps the catch and grease crowd happy because it is easier to catch more fish due to using a sharper hook. Many of the competition hooks have really become popular over the last decade throughout America. They are sharper overall and offer much better hook penetration to the upper mouth area when using the jig hooks. The top hook above in the picture is a 450 BL Hanak Jig Supreme. It rides upside down and hooks fish consistently in the upper part of the mouth. Hooks such as Hanak, Fulling Mill, Dohiku, Maturo, and many others have given fly tiers access to much better quality wire than years ago. You can use pliers to crimp the barb from hooks but this can lead to broken hook points especially for saltwater hooks. For general trout and other warm water species, you can also just purchase very sharp wire that is already barbless. I tie flies most often through the winter months and find it much easier to purchase quality barbless wire from the start. Many folks blame dropped fish on the hook because the wire lacks a barb. Fish are dropped when hooked because of reduction in tension! Barbless hooks increase your catch when you maintain tension on the line! The rod becomes straight is a sure sign giveaway! One other quick tip is to find a sharp quality hook that you are confident in and stick with it. For most wires (barbless or barbed) a downturned eye is an advantage when fishing due to the difference in leverage. Smaller sized hooks you will notice an increased percentage of a hook with a larger hook gap. Many angling cultures in the south pacific have used various shapes for thousands of years which affect leverage and holding power. I believe certain wire attributes lead to an overall higher percentage of fish landed. Stay with the wire you have had the greatest success with on the stream! Many wires are too thin for the spear point and dull quickly especially very fine dry flywire. Durability remains better with medium to heavy wire hooks. A heavier wire can stay sharp for hundreds of hookups. Use a diamond hook file as well as a few nail files when the hook becomes dull. You can test the hook point on the thumbnail and it if slips rather than digs in then hit it with the file or change hooks. A good hook honing stone is worth packing in your vest for this reason.